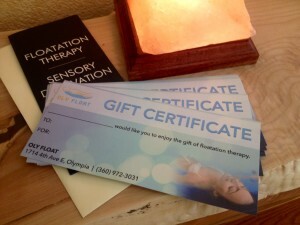 A gift certificate for floatation therapy with Oly Float, or any of the services available at The Soul Space, is a true gift of care. Perfect for the person who already has every thing they need, except perhaps peace, a Soul Space gift certificate is unique, surprising and ultimately the gift that keeps on giving. Gift Certificates are available for single float sessions, packages of floats, massage, cranio sacral therapy, energy counseling, or any combinations of our services. Our certificates are printed on gift-quality card stock and accompanied by literature explaining the gift that’s being given. Alternatively, you can buy a gift certificate that you can print at home and/or automatically email to someone else. If you’d like one of our high quality card-stock gift certificates, it’s best to give us a call at (360) 972-3031. We can take payment over the phone and mail the gift to wherever/whoever you want. We can also write up a gift certificate for whatever you want. If the option you want isn’t listed, just give us a call at (360) 972-3031 to discuss what you need. Float Club Members: You can use your membership floats to give gift certificates to friends, family and co-workers. Great for those last-minute wins!